So, what does it take to succeed as an entrepreneur? Two ingredients at the top are connections and guts. With that in mind, three years ago Silicon Valley Bank launched The SVB Trek. We are inspired daily by the ingenuity and passion of the entrepreneurs and investors we work with at SVB. And by banking half of U.S. venture capital-backed companies and a growing global clientele, we gain killer insights early on. To champion the next generation of innovators, we open our doors each year to connect ambitious, entrepreneurially minded college students with creative minds, world-class investors and industry leaders. During the four-day Trek, we dive headlong into the innovation ecosystem through an immersive learning experience featuring salon-style events, interviews with industry luminaries and hands-on workshops, plus iconic tours throughout San Francisco and Silicon Valley. SVB and our partners believe when you’re solving the world’s most difficult problems, access to forward-thinking problem solvers is critical. So The Trek aims to be an opportunity for students from across the world to build a network of peers and advisors, while gaining unique insights to propel them to the next stage of their career development. Jake Mendel’s career path was transformed after joining the 2016 Trek class a year ago. An Ohio State MBA student with two startups under his belt, Jake was toying with a career in investment banking. But then he did a gut-check. Today, he and fellow Trek alum Zeenia Kaul have raised enough capital to launch a company focused on nutriceutical supplements for cancer patients in remission. Their partnership took root at The Trek. The Trek selection process is rigorous, and we work side by side with leading universities to find a small group of students each year who reflect diverse backgrounds, academic experiences and career pursuits. The trailblazers in the Trek Class of 2017 have already achieved impressive feats. They include: the inventor of gloves that translate sign language to English; the co-founder of an app that measures air quality to determine when to stay inside; a developer of an educational program to help autistic students communicate; a developer of an alternative source of protein in the form of crickets, the CEO of a platform to mobilize individuals to invest collaboratively and the developer of a “lawyer” bot that appeals parking tickets for free. Our “guides” at The Trek are in the trenches and have lived through the ups and downs of startup life. We encourage these technology leaders to candidly recount their startup journey, including their failures. Some of the guides for this year’s Trek include Peter Boyce II, Co-Founder of Rough Draft Ventures and VC at General Catalyst, Jess Lee, Partner at Sequoia Capital, Mike Maples, Jr., Partner at Floodgate, and Clara Shih, Co-Founder and CEO of Hearsay Social. * Co-Founder, Small Farms, an alternative source of protein in the form of crickets. 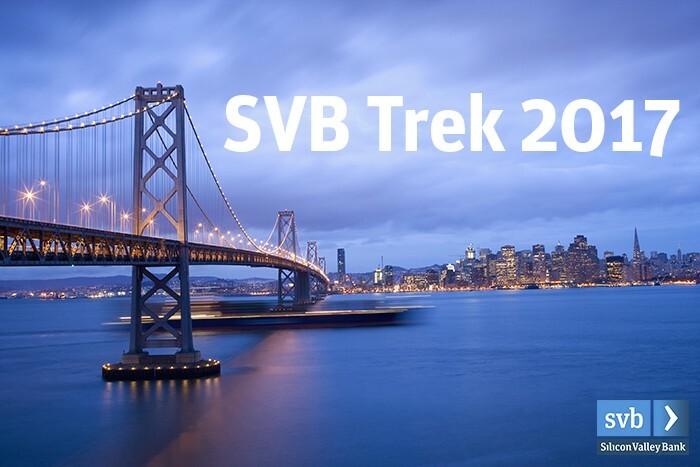 To learn more about The Trek, please contact us at svbtrek@svb.com and take a look at our ViewFind on last year’s Trek experience here.